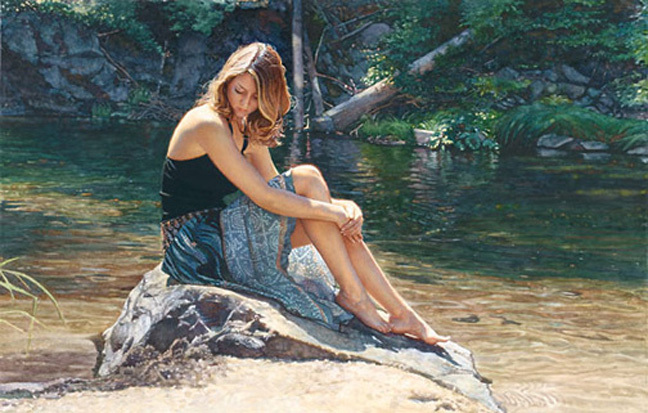 "I often paint women near the water," says artist Steve Hanks, "and each body of water has a different meaning, a different feeling." A painting of a woman and the ocean, for example, offers perspective and the sense that "your problems are no larger than a grain of sand." The subject of a lakeside portrait may be seeking solace and a sense of security. A river painting, however, is different. "A river is heading somewhere, it's got direction," says Steve. "This piece is about listening to the world you're in and waiting for its guidance. The woman is thinking about where she's headed."